"They fired everybody who was insufficiently supportive of Trump," one of the sources who spoke with CNNMoney said, adding, "how do you define being 'sufficiently supportive' of Trump?" But if it was about politics, it was also about money. RedState writers work on contract and are paid based on the amount of traffic to their posts. "Those who had been under a contract with a higher per-click rate were mostly all tossed, only keeping those who were pro-Trump even if their traffic was comparable," another one of the sources said on condition of anonymity. "Of those who make less under their contracts, they mostly tossed those who had been openly critical of the president," the source said. "It seems to have been a cost saving measure, but the deciding factor between any two people seems to have been who liked the president and who didn't." Salem had no immediate comment. But an internal memo obtained by CNNMoney confirmed the housecleaning. "We had to make some tough changes to RedState today," Townhall general manager Jonathan Garthwaite wrote in the memo. "While these changes are painful, they were necessary once we reached the conclusion that we could no longer support the entire roster of writers and editors." 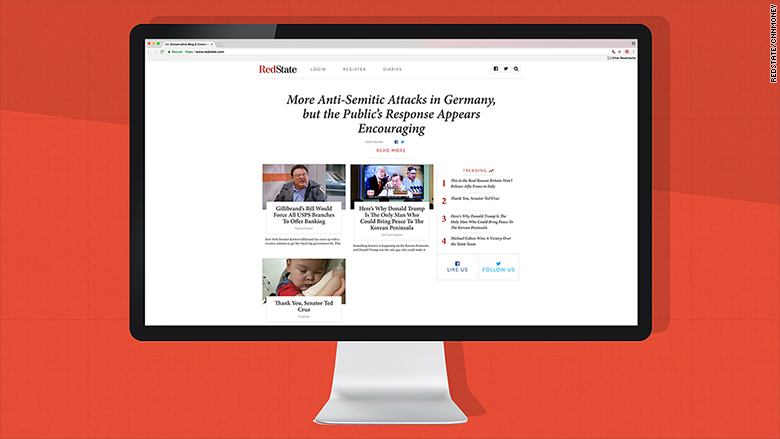 RedState, a 13-year-old blog that was founded by Erick Erickson, is one of several sites in Townhall Media's portfolio. Townhall, in turn, is owned by Salem Media Group, a conservative media company that also operates radio stations and publishes books. Salem has previously been scrutinized for its treatment of radio hosts who weren't toeing a pro-Trump line during the presidential campaign. A source with ties to RedState said bloggers had been "wondering if this was going to happen at RedState," meaning "anyone who wasn't a big fan of Trump would be dumped." RedState has been reflective of the divides within the GOP and the conservative movement, with a spectrum of writers with varying reactions to Trump's political choices and personality conflicts. Garthwaite did not respond to a followup request for comment on Friday. His initial email to writers said, "there's no getting around the fact that this is awful news, but I value your contribution to RedState and I hope you will stick with it through this tough period and keep RedState going." However, some contributors then received a separate email indicating that they were out. Their accounts were locked, meaning publishing rights were revoked. Caleb Howe, one of the site's lead editors, was among those dismissed. He cryptically tweeted on Friday, "There is a right way to do something and a f---ed up way." His tweet aimed at an unknown person, saying, "You can call me back or you can watch this unfold right here, guy." Howe did not respond to requests for comment from CNNMoney.